The building has been recently renovated and it has a comfortable elevator that leads to the Reception, in contemporary style, where the welcoming and professional multilingual staff will set the start of a relaxing stay in the sign of leisure. The structure offers to de reisaanbieder guests a continental breakfast enhanced by the freshness of typical Neapolitan products of high quality pastry. It also has: American Bar with 24hr service, free WIFI in the whole structure, 24hr Reception, Laundry service, Nearby affiliated car parking, Valet service, Private car service, hiking and Tour booking. 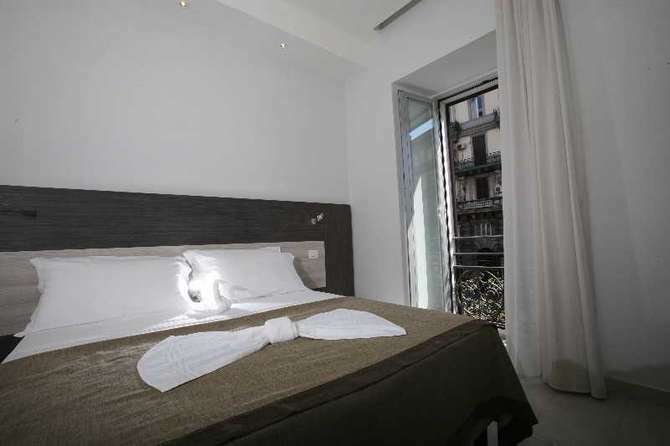 Offers 7 rooms with private bathroom, all of them soberly furnished in a functional and modern style, characterized by relaxing colors and lighting combination that give a unique atmosphere. All rooms are provided with main facilities, like: flat TV with cable, air conditioned / heater individually controlled, free WI-FI, telephone for outside calls, soundproof windows, security box, hair dryer, reception line. Napoli Suite is a new opening structure situated at the door of the vibrant, intricate and colorful historical centre of Napoli in Corso Umberto, one of the main arteries for the city shopping, few steps from Naples Central Railway Station, focal point of the Neapolitan public transportation, from where is possible to easily reach the main points of interest of Naples and Campania. Thanks to de reisaanbieder strategic position Napoli Suite is the right solution to live a unique experience of staying in a context rich of cultural, artistic and gastronomic attraction. The structure is situated on the second floor of an early '900 aristocratic palace.